Sea turtles face a variety of dangers, both natural and man-made. Threats accumulate over long periods of time and can occur anywhere in a population’s range. Because sea turtles are highly migratory, localized declines often result from a combination of factors, both domestic and foreign. As long as nesting beaches continue to be lost, marine habitats degraded, and sea turtle fisheries (and bycatch) operate at unsustainable rates, population recovery will be difficult to achieve. 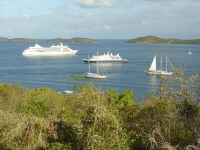 In the Wider Caribbean Region, a largely unmanaged harvest has spanned centuries. 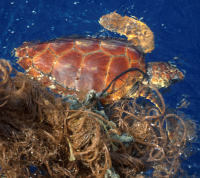 In addition, sea turtles are accidentally captured in active or abandoned fishing gear, resulting in death to tens, if not hundreds, of thousands of turtles each year. Coral reef and seagrass degradation, chemical pollution and marine debris, high density coastal development, and an increase in ocean based tourism are among the many factors that have damaged or eliminated important nesting beaches and feeding areas throughout the Caribbean Sea. 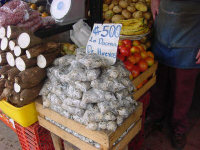 International trade in turtle products has also contributed to the demise of some species. Sea turtles must return to the land to lay their eggs, and many contemporary threats are associated with physical development on or near nesting beaches. For example, artificial lights confuse both adult females and hatchlings, disorienting them and luring them away from sea, making them more vulnerable to predators, dehydration, exhaustion, and an untimely death. Obstructions (e.g., beach chairs, umbrellas, sailboats) left on the beach can prevent sea turtles from finding suitable nesting habitat and, later, fatally hinder hatchlings from finding their way to the sea. Beach driving and the mechanical cleaning of beaches can crush incubating eggs and tire ruts trap hatchlings as they crawl across the beach to the sea. Beach sand mining scars the terrain, accelerates erosion, and degrades or destroys stabilizing beach vegetation by extraction or saltwater inundation. The loss of sandy beaches to mining not only reduces the reproductive success of sea turtles, but endangers beachfront property and has serious economic implications for locally vital industries such as fishing and coast based tourism. Beach litter can entangle or trap emerging hatchlings, preventing them from reaching the sea. The smell of garbage draws non-native predators such as dogs, raccoons, rats, and mongoose that eat eggs and hatchlings. Natural predators, including ants, vultures, crabs, and so on, also take a toll. Once at sea, predatory birds and fish prey on hatchlings and larger sharks and other predatory fish (and sea mammals like Orca whales) prey on juveniles and adults. In addition to predatory birds, fishes and sea mammals, turtles face man-induced threats far from shore. Large quantities of marine debris are found in the ocean: plastic can block the stomach and hinder buoyancy and respiration, and sea turtles can die from eating plastic bags mistaken for jellyfish. 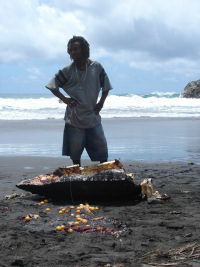 Dredging, indiscriminate anchoring, blasting and chemical fishing also contribute to sea turtle mortality. Pollution from industrial, residential and agricultural operations and the dumping of untreated or under-treated sewage directly into the sea harms sea turtles and their habitats. The addition of organic pollution, nutrients, and sediments encourages algal growth while negatively affecting seagrass beds and coral reefs, both critical habitats for endangered sea turtles. Oil spills can be lethal to sea turtles (crude oil significantly affects the skin, some aspects of blood chemistry and composition, respiration, and salt gland function) – and eggs can also be affected when oil and tar contaminate nesting beaches. 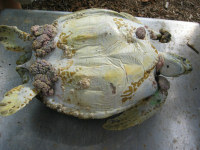 Various diseases and parasites affect the health of sea turtles. Fibropapillomatosis, certain species of encrusting barnacles, blood flukes and roundworms can all cause harm to sea turtles. Fungi and bacteria sometimes invade nests, lowering the probability that the eggs will hatch. Invading plant roots, especially from creeping beach vines, can also engulf and destroy incubating nests. Many of these threats can be reduced through thoughtful action taken by developers and coastal property owners, fishermen, conservationists, regulators, and concerned citizens. Many science-based solutions are available at this website – if you have any questions, please don’t hesitate to contact us!